These are older Reproduction pieces that have been Refurbished in our workshops. The items are cleaned and repolished, new leather tops and handles are fitted where needed. Good savings on new prices. We are one of the only companies in the UK offering these items to our knowledge. Please view our current stock. Note. All Desks shown, made in three sections, making it easier to deliver and install, unless otherwise stated. A large Oak, Computer Base Cabinet. Fielded Paneled doors and sides. The interior is fitted out to take a PC Tower unit, with two pull out slides for a Keyboard and Printer. A matching pair of Dark Oak, Three Drawer Filing Cabinets. Each cabinets has three locking drawers with bars for suspending foolscap files. Decorative side and back mouldings. Solid brass handles, new keys and new wine leather inlaid tops. This versatile cabinet has plenty of storage for all your PC equipment. The top section has split folding doors. Inside there is room for a monitor up to 25" wide by 21" high. Two CD storage drawers and a pull out slide for a printer/scanner. There is a pull out keyboard drawer in the middle section with further storage in the base cabinet with split folding doors and room for a PC and printer on a sliding shelf. Polished to a golden oak shade with solid brass handles and fittings. A Mahogany Computer Desk. ( previously supplied by The Desk Centre ) Storage for a PC tower in the left pedestal, a printer cupboard on the right pedestal with a pull out slide. Two locking top drawers with a keyboard centre drawer. The desk top has the original Wine leather top with two brass cable holes. A Solid Pine Desk. The seven drawers including a middle keyboard drawer that pulls out and folds down to work on. Two deeper drawers for files and four further single drawers. All with pine round turned knobs. There is a useful shelf between the pedestals that will hold a printer or Lever arch files and books. Cleaned polished and waxed. The desk top has been re lined with a new Tan leather with a thin gilt line. A new Ex showroom Display, one off special size, Oak Computer Desk. Fitted with a Keyboard centre drawer a cupboard in the left pedestal, three further single drawers and a double filing drawer. Polished to a Medium Oak Shade with a Wine leather top. Solid Brass handles. A Yewood L Shape Desk. The polished top return platform can be fitted on the left or right side of the desk. The pedestal under the return is open. There is a locking middle drawer with the other pedestal having a double depth drawer and two single drawers. Re polished and fitted with a new Bottle Green leather top. The following Desk Sets have been carefully selected and put together to offer a ready made study/office solutions. A larger Yewood Reproduction Pedestal Desk. Eight drawers including a double depth drawer in the right hand pedestal. Locking top drawers. Fitted with new brass swan-neck drop handles. Shaped Bracket Feet. Raised decorative mouldings on the sides & back of the pedestals. The desk top has been inlaid with a new bottle green leather. A small Yewood Kneehole Desk, Just 3 ft wide. Shaped bracket feet with eight drawers and a kneehole cupboard. Locking top drawers and cupboard with a Bottle green leather top. A good quality Beven & Funnel Two Drawer Filing Cabinet. Antique Mahogany Finish. New Green leather top. A Dark Mahogany Two Drawer Filing Cabinet. 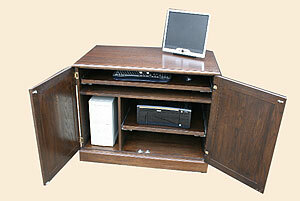 A Yewood Computer Desk. Two cupboards for storing a PC Hard drive and a Printer on a pull out slide. 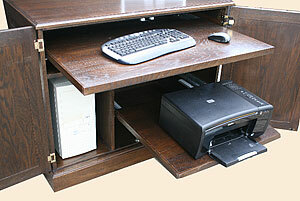 There is a keyboard centre drawer with pull out tray and two single drawers either side. Brass cup handles and a brass cable hole on the desk top. New tan leather fitted. A Yew wood Computer Pedestal Desk. A keyboard centre drawer with pull out tray, plus three single and one filing drawer. Solid brass handles. The left pedestal has a storage cupboard with a pull out slide for a printer. Olive green leather top and two round brass cable tidies with internal holes to connect wiring. An very impressive Oriental Solid Hardwood Desk ( probably Chinese ) Made with filing drawers in each pedestal, plus five further single drawers. Solid brass handles. Shaped plinth bases. The sides have Chinese style dragons carved into them. The decorative back modesty panel again has a Chinese dragon design cut into the panel. Polished to a rich rosewood shade. We have fitted a new wine coloured hide leather top with a gilding pattern to compliment the brass handles. A Four Drawer Mahogany Filing Cabinet ( original sold by The Desk Centre ) Locking drawers, brass handles, shaped plinth base. Fitted with a new bottle green leather top. A Cherrywood Reproduction Computer style desk ( previously made by The Desk Centre ) We have a number of these excellent desks which were originally made for an office in the West End of London. The desks are made with no centre drawer, giving more legroom, three single drawers a double depth drawer and a cupboard in one of the pedestals. Brass cable management holes are fitted in the top. The woodwork and the original Bottle green leather tops have been re polished. To fit a new different leather colour top of your choice add £125 for the 2ft 6” depth desk and £150 for the 3ft depth desk. Price 5ft x 2ft 6” size £795. Price 5ft x 3ft size £849. A Dark Mahogany Pedestal Desk and Single desk chair. The Desk measures Width 48” ( 122 cm ) x Depth 24” ( 61 cm ) Height 30” ( 76 cm ) Three locking top drawers. A double depth drawer in the right pedestal. Shaped pedestal feet, canted desk top corners. Fitted with a new tan leather desk top. The single mahogany desk chair tucks into the kneehole area and is upholstered in tan leather with a plain seat and buttoned back. Price for the set £795. A Mahogany Reproduction Pedestal Desk. Shaped feet, three locking top drawers and a double depth drawer in the right pedestal. Dark mahogany polishing shade with a new bottle green leather top. A Dark Mahogany Desk and matching Viscount Style Swivel Desk Chair. 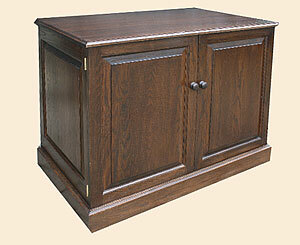 The Pedestal Desk has nine single drawers with the top three lockable. Decorative handles and shaped plinth pedestal bases. Fitted with a new pastel blue leather top and Rose pattern gilding. Supplied with a new Dark Mahogany Viscount style swivel chair, upholstered in matching blue leather, buttoned seat and back. A Yewood Filing Cabinet. Two locking drawers, bars for hanging files. Shaped feet. Green leather top. A Yewood reproduction pedestal desk on shaped bracket feet. Eight inlaid drawers ( the top three lock ) A double filing drawer on the right hand pedestal. Raised shaped decorative mouldings on the sides & back. Original swan drop handles, Green leather top with shaped corners.